It’s Wild About Books Wednesday! If you’re new around here, on many Wednesdays I stop in to talk about how you can use a given book in speech-language therapy! I adore literacy-based therapy, because there are so many different goals you can tackle with any book! 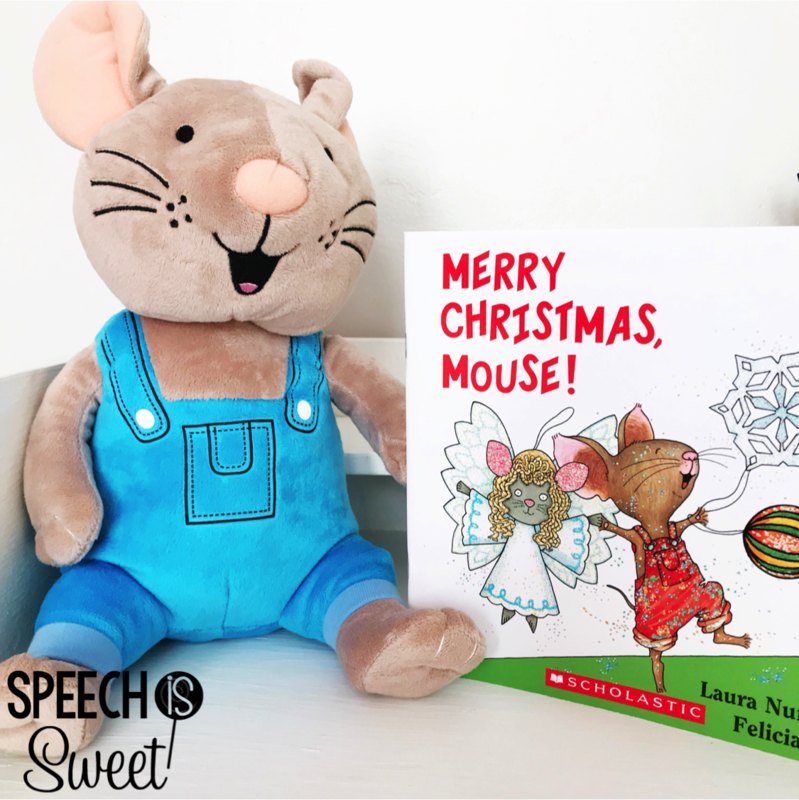 Let’s talk about Merry Christmas, Mouse by Lauran Numeroff! I adore the If You Give a…. series! Mouse is back for some Christmas fun! 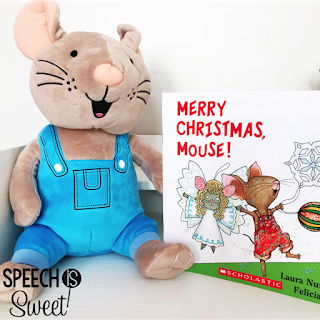 This is a very simple story about Mouse decorating a Christmas tree! It starts with one star, then two angels, and so on! There are many communication goals you can address with this story! 1) Quantitative Concepts – Ask how many rockets are on the tree? You can also work on more and less! Example: There are more rockets than angels or there are less reindeer than toy soldiers! 3) Plurals – This is such a great book to discuss singular vs. plural. There is only one angel (so that word is singular) and all of the other words are plural, because there are more than one! 6) Compare/Contrast – You can compare/contrast the different ornaments that Mouse puts on the tree! you can also compare this story to Happy Easter, Mouse or Happy Valentine’s Day, Mouse! 7) Describing – You can work on describing all of the different ornaments! There is a really nice variety (ex. rockets and snowmen). 8) Inferencing – Near the end of the story it says “only a hundred more to go!” and shows an enormous pile of ornaments! There are some cookie ornaments too! If you have read If You Give a Mouse a Cookie to your students, they can infer what Mouse’s favorite ornament is! Also, on the very last page Mouse looks extremely worried and the Christmas tree is tilting! This is a great opportunity to practice inferencing! Why is he worried? Why is the tree tilting? 10) Following Directions – You can draw a Christmas tree on a mini dry erase board and then give your students instructions for drawing on more ornaments! You could also bring in a mini Christmas tree and have students practicing following directions with a variety of ornaments! This would be such a fun way to bring this book to life! Have you ever used this book in therapy? What skill did you address? Please leave a comment and let me know! Don’t forget to subscribe to my newsletter if you’re interested in weekly updates from me and access to a free resource library! Thank you for these ideas! I am a homeschool mom – my oldest is in Speech Therapy. I am always looking for ideas to help him at home.